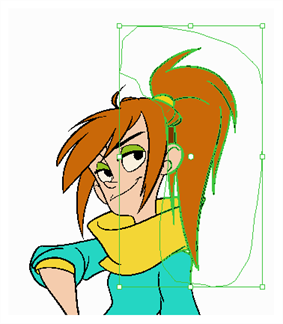 The Cutter tool lets you cut out part of a drawing so that you can transform it, copy it or delete it. In the Tools toolbar, select the Cutter tool or press Alt + T.
In the Stage or Camera view, draw a lasso around the artwork you want to cut away. The artwork inside the lasso you drew will be cut from the rest of the artwork and will be selected. You can add another part of your artwork to the selection by holding Shift and drawing another lasso. By default, the Cutter tool will only work on the current layer. You can cut artwork from all visible layers by holding the Ctrl (Windows/Linux) or ⌘ (macOS) key. To move the selected artwork, click and drag it. To delete the selected area, press Del. 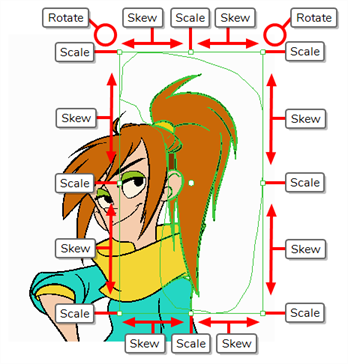 To scale, rotate or skew the selection, use the controls around the selection's bounding box. NOTE To transform your selection, see Transforming Artwork with the Select Tool..